What is a 'twist angle', and what is it good for? It's one fast and easy way to measure the twist in a singles yarn--whether yarn you're spinning right now, or yarn that's been sitting around for a while. It was thanks to articles by Rita Buchanan in Spin-Off that I began to understand the usefulness of twist angles. I'll put references to the particular articles here when I have time to dig them out again. There's also information in Mabel Ross' The Essentials of Yarn Design for Handspinners, but I found it a bit too technical to readily understand until I had read Rita's articles. The book comes with a pull-out card for measuring twist that is a little tricky to use. Below you'll find my version of her twist angle card that's easy to make and use. Why would you want to measure twist? Suppose you spun a bunch of yarn at one time, all the same way. You work on your project for time, then set it aside. A year or more later you come back to it, determined to finish it--but you find you don't have quite enough yarn spun. You've got the fiber, so you sit down to spin it. Here's another problem--you can't spin the yarn just the same because your spinning style has changed in the meantime, and the amount of twist you put in the yarn is different. You try some of the newer yarn in your project, but it looks so different from the old that it just won't work. By measuring the twist angle of the original yarn you spun, you can check your new yarn against that angle while you spin. That plus 'wraps per inch' will help you duplicate yarn no matter how long it's been since you spun the first one. Or, if you admire someone else's yarn, you can take its measurements and, if you have similar fiber, come close to duplicating it for yourself. First you need to make a card marked with angles to measure your yarn against. Find a protractor or other device marked with angles, and a lined 3 x 5 inch index card. Cheap plastic protractors are found in the stationary/school supply section of most stores. You can see on the card pictured here that the "0" degree line is straight up and down along one of the lines on the card. Mark the halfway point on that line. All your angles will be drawn from that spot. Lay your protractor so the hole is over the center mark, and the "0" degree line is right on the line on your card. Use a pencil to make a short line at the 5 degree, 10, 15, 20, 25, and 30 angles along the edge of the protractor. More can be marked if desired, but I wouldn't bother unless you routinely spin very high twist yarns. If your card is too short for the size of the protractor, place the card on a piece of paper and, making sure the card doesn't move, mark the angles on the paper. Finally, carefully draw straight lines from the center mark to the pencilled marks for each angle, and write in next to the line which angle is which. 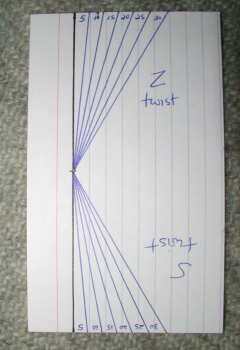 Repeat on the other end of the card so that you'll be able to easily measure twist angles for both 'Z' and 'S' twist. 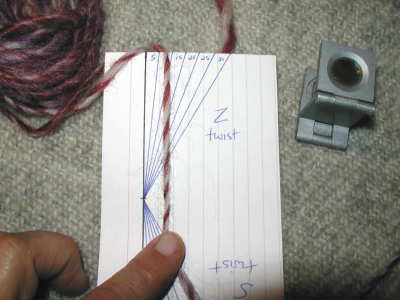 This picture illustrates measuring the twist angle of a singles yarn. I've anchored the yarn in a small slit at the top of the card, and I hold it straight, parallel to the lines on the card, with my finger. Don't pull it tight--just hold it under enough tension to keep the yarn reasonably straight. More tension than that will stretch the yarn, making the angles measure more shallow than they really are. If the yarn is quite fine, or all one color, it helps to have a magnifying device of some sort handy. You can see a device to the right of the card, variously called a pick glass, linen tester, or map reader. It provides 10 times magnification. I can easily pick it up and place it on the yarn to see it more accurately. To determine the approximate twist angle of this piece of yarn, look at the slant of the individual fibers--readily visible in this section. Whatever angled line on the card most closely matches the slant of the fibers in the yarn is that yarn's twist angle. More than likely, different sections of yarn will have slightly different twist angles. The more smoothly spun the yarn, the more accurate this method of measuring twist will be. That's one reason why I only mark every 5 degrees on my card--not being a machine, my yarn will never be perfectly even. More accurate measurements would be possible, but not really tell me anything important about my yarn. If you keep the card (and magnifying glass) next to your wheel, you can stop spinning at any moment and easily check the twist angle of your yarn. Then you can adjust your spinning as much or as little as needed to keep the yarn spun like you want it. For low-twist yarns you may need a twist angle of around 10 degrees. For yarns to be plied into socks, you might need a twist angle of 20 degrees. Whatever you decide is good for your project, the card will help you keep on track. Another method for measuring the twist of a yarn is to count the twists per inch. This involves placing the yarn on a measuring device like a ruler or marked card, and counting the number of times a single fiber spins around the yarn. I find this method cumbersome for a number of reasons. One is that it is very difficult for me to see a single fiber well enough, even with magnification, to be sure I'm counting only its path, and not it plus some of its neighbors, leading to inaccurate measurements. Another challenge is that there's rarely a whole number of twists--often it's a fraction per inch; again that's hard to count when measuring a given section of yarn. Finally, it doesn't give me information about how lofty the yarn is. A fine yarn spun with short-stapled fiber at three twists per inch probably won't be structurally sound, but a thick yarn of long-stapled fiber may be quite tightly spun at the same measurement. Twist angle, on the other hand, gives consistent information regardless of the thickness of the yarn spun. Whether you're spinning a bulky-weight Lopi-style singles from long Icelandic wool or a fine baby yarn from Merino, a 10 degree angle of twist will be lofty, while a 20 degree angle had better be plied and a 30 degree angle will give a hard feeling to the yarn. Most of what I do in my spinning is devoted toward gaining skill at spinning consistent yarns. That way I can pick up a project after a year or more has gone by and be sure I am spinning a yarn that will match all the previous and future yarns for that project. Measuring twist angles is one important tool in spinning consistently. No, not every inch of my yarn is exactly 15 degrees or whatever I'm aiming at--but it's pretty close throughout because I check periodically to make sure I'm still on target. It's been written that you must convert twist angles into turns per inch in order to be able to use it while spinning. I don't find that to be true. I don't count treadles--in fact, I can't when I'm using my electric spinner--but I can use twist angles readily to check the amount of twist in my yarn. It's just a matter of practice and motivation. If it doesn't interest you, then don't bother :) But if you someday want to reproduce yarn you spun years ago, this technique will help you do it with success.